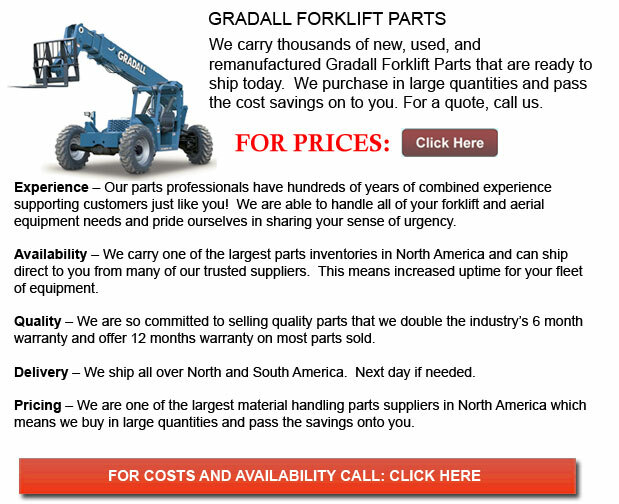 Gradall Forklift Parts - The Gradall excavator was the creation of two brothers Koop and ray Ferwerda. The excavator was created In the 1940's all through WWII, when there was a shortage of workers. The brothers faced the problems of a depleted labor force due to the war. As partners in their Cleveland, Ohio construction company called Ferwerda-Werba-Ferwerda they lacked the available workers to be able to perform the delicate work of finishing and grading on their interstate projects. The Ferwerda brothers decided to build an equipment that would save their business by making the slope grading task easier, more efficient and less manual. The initial excavator prototype consisted of a device with two industrial beams on a rotating platform fixed to a used truck. There was a telescopic cylinder that was used to move the beams back and forth. This allowed the fixed blade at the far end of the beams to push or pull the dirt. Before long improving the very first design, the brothers built a triangular boom so as to add more strength. Additionally, they added a tilt cylinder which let the boom rotate 45 degrees in either direction. A cylinder was positioned at the rear of the boom, powering a long push rod to allow the equipment to be equipped with either a bucket or a blade attachment. Gradall launched in 1992, with the introduction of the new XL Series hydraulics, the most innovative adjustment in their equipment since their invention. This new system of top-of-the-line hydraulics enabled the Gradall excavator to provide comparable power and high productivity to the more traditional excavators. The XL Series ended the original Gradall equipment power drawn from low pressure hydraulics and gear pumps. These conventional systems efficiently handled finishing work and grading but had a hard time competing for high productivity tasks. Gradall's new XL Series excavators showed more ability to dig and lift materials. With this series, the models were produced along with a piston pump, high-pressure system of hydraulics that showed marked improvement in boom and bucket breakout forces. The XL Series hydraulics system was even developed together with a load-sensing capability. Conventional excavators utilize an operator to be able to pick a working-mode; where the Gradall system can automatically adjust the hydraulic power meant for the task at hand. This makes the operator's general task easier and even saves fuel at the same time. When the new XL Series hydraulics reached the market, Gradall was thrust into the extremely competitive industrial machine market that are designed to deal with pavement removal, excavating, demolition and various industrial work. The introduction of the new telescoping boom helped to further improve the excavator's marketability. The telescoping boom gives the excavator the ability to work in low overhead areas and to better position attachments.